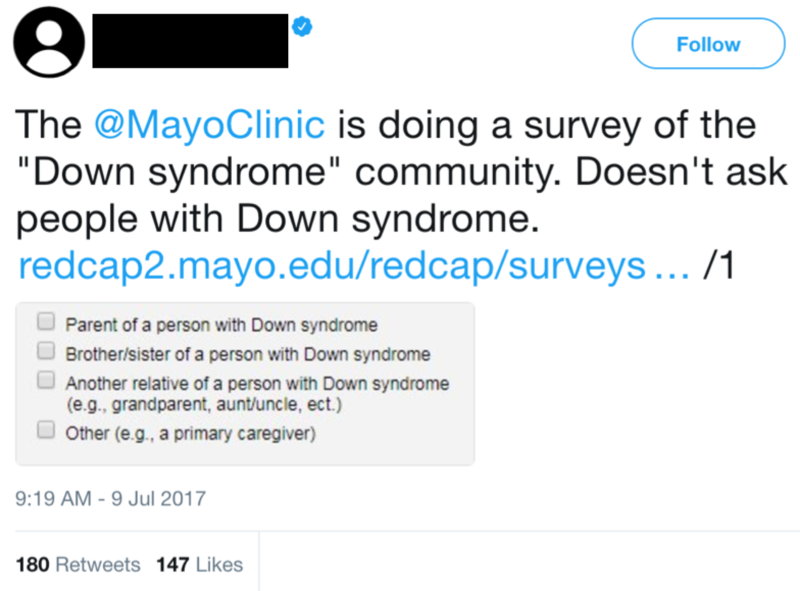 A few weekends ago I was on comment monitoring duty for Mayo Clinic and started to see displeased tweets rolling in about a research study. That tweet resonated with people, evidenced by 180 retweets and 147 likes. Another person called the study shameful, and yet another questioned the validity and reliability of the survey questions. 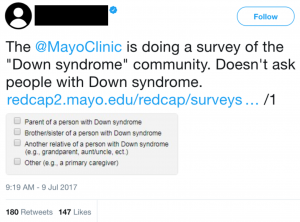 Since this took place over the weekend, one Twitter user announced his plan to call Mayo Clinic on Monday. I informed the study’s principal investigator (PI) about the online consternation. On Sunday the PI had also received a media inquiry about this. The research team was very surprised by all this. They never intended to make anyone with Down syndrome feel they were being excluded. Family members of individuals with Down syndrome had actually suggested the study to the researchers and had approved the study text before it was submitted to the Institutional Review Board (IRB). She also wrote a lengthy reply to the media inquiry, which was routed through Public Affairs, before being sent to the reporter. 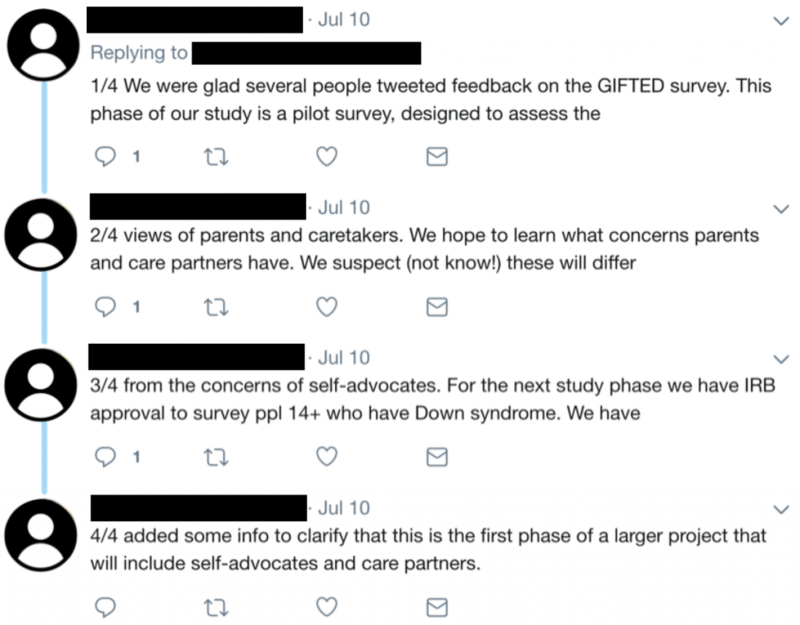 There were many reasons why the study was set up the way it was, such as why a separate survey with different questions was to be used for those with Down syndrome, in comparison to the caregiver survey. Ideally, the research group would have been able to explain more context in the introductory text. However, explaining the context of a study while not biasing prospective participants in ways that may cause them to change their responses is a delicate line to walk. Admittedly, the introductory text for this study could have initially stated this survey was for caregivers. The research team learned from the valuable feedback and updated the intro text slightly. Of note, if this is done, the IRB needs to also approve the text before making the change. Through social media, we quickly became aware of people’s concerns. Through social media, our research team received valuable feedback and adjusted accordingly. And, through social media, the principal investigator engaged publicly to address concerns. What about the media inquiry? In the end, there was no story to be written. Makala Arce is a Senior Communications Specialist at Mayo Clinic and a member of Mayo's Social & Digital Innovation Team. extremely valuable in giving them a new perspective on how patient populations were looking at this issue.